Experience the lush green countryside with a delightful fragrance of our Sandal Cinnamon Incense Sticks. You can easily loose your senses to our exotic collection of Incense Sticks that soothes the mind and creates a spell bounding environment. Lingering fragrance of our Sandal Cinnamon Incense Sticks emanates a royal splendor and luxury that spread a majestic effect. These sticks are ideal for daily worshiping purposes as well as refreshing the surrounding in spas, therapeutic centers, and other "feel good" institutions. 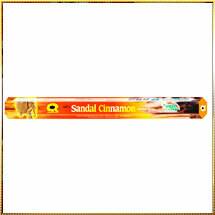 Fragrance of our Sandal Cinnamon Incense Stick is like an enchanting world of sweet dreams hypnotizing just any body. We assure that this fragrance will surely suit your vibrant mood.